For those of you not familiar with the flooding problems in Kingwood, there is a widespread consensus among flood experts and that community that a large sand bar which has accumulated where the West Fork of the San Jacinto River enters Lake Houston is one of the major causes of flooding in Kingwood. 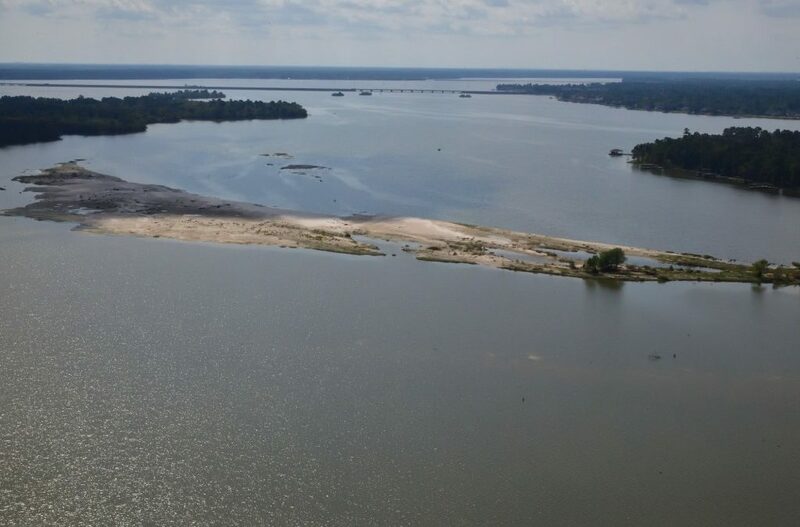 That sand bar, now commonly referred to as the Mouth Bar, essentially acts as a dam of the West Fork, backing up water into homes and businesses in Kingwood. Everyone agrees that it needs to be dredged out. Read more [here] and [here]. Dredging the bar is the City’s responsibility because Lake Houston is the City’s reservoir. But for the City to do so it needs a permit from the Corps of Engineers. Incredibly, the City’s flood czar, Steven Costello, reported to the Kingwood CIP meeting last Thursday night that the City has yet to even file for the necessary permit. Costello said he “hopes” to have it on file next week. The story of how the City has not been able to even get a permit on file for such a critical project, much less actually complete it, is a case study in the insanity of federal bureaucratic red tape and the City’s sloth. It is clear from aerial photography and previous surveys that a sand bar existed at that location before Harvey, but it was much smaller. The additional sediment dumped there by Harvey made it much worse. But the City must demonstrate how much worse because under FEMA rules, it can only pay for accumulation that resulted from the storm. Any previous accumulation is due to the City’s failure to maintain its reservoir and, therefore, its responsibility. Once that report is finished and submitted to FEMA, it will have to approve the amount and funds will be available. Costello indicated that he did not think getting FEMA’s approval is going to be a problem or cause much of a delay. We’ll see. By next week, according to Costello, the City will have the final report from the coring company, reach an agreement with FEMA, and file the dredging permit with the Corps. Costello also said he hopes to obtain expedited Corps consideration of the permit. (There was a lot of “hoping” and “expecting” at the CIP meeting.) US Rep. Dan Crenshaw made a brief appearance at the beginning of the CIP meeting and promised he would push and shove all he could. Perhaps Costello can pull all of those rabbits out of his hat next week, but I will believe it when I see it. It seems awfully convenient that all of these things were just about to be finished at the same time Costello and Turner had to face a room full of flood-weary Kingwood residents. Here is the question I would be asking if I lived in Kingwood: Why did it take over 18 months for the City to take the preliminary step of ordering the core samples? I totally get that the aftermath of Harvey was chaotic and can easily understand how it would take some time for our City officials to research these issues and get up to speed on the process. But a group of local residents, working without the vast resources of the City, had it figured out back in the summer of 2018. Had the City acted expeditiously back then, the Mouth Bar would probably be gone by now. One source told me that the City filed an application with the Corps in November 2018 which apparently did not include all of the necessary information. As a result, the Corps sent the City a request for additional information which prompted the City to withdraw its incomplete application, but I have not independently verified that information.